(And what DON’T kids find irrelevant information , because they know EVERYTHING – am I right??) And other times they are under aroused (aka BOOOOOORRRRED).. These bands are tied around the bottom of the child’s chair so they can kick and play with it as they write and or listen at their desk. By giving kids who need to move or fidget something to do in their seats it keeps their hands free and allows them to stay focused on their work. 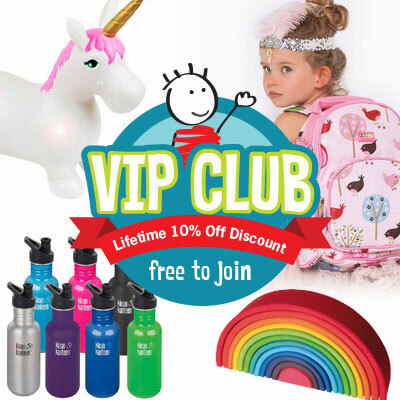 It doesn’t disrupt the the rest of the class either as it’s a quiet activity AND they are really well priced items! These are such a lifesaver for us! Since Kindy my son has had one on the floor and or on his seat. 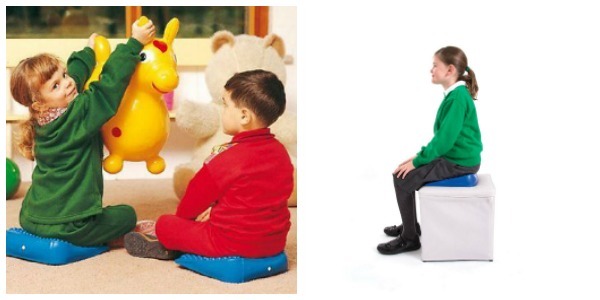 They are the perfect seating option for kids who have a hard time staying put, who don’t know their own body space, or who have vestibular seeking movements (Vestibular stimulation is the input that your body receives when you experience movement or gravity. It can be mild; nodding your head or climbing stairs or it can be intense; skydiving or a rollercoaster . – Think a child upside down watching tv or being fearful swings , kids that enjoy busy, energetic activities etc) . 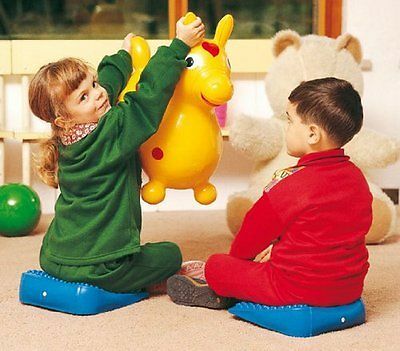 These air cushions have two sides (one with bumps and the other smooth) and allow them to stay focused by providing all the wiggle, sensory input needed. The only difference between the wedge is that it helps the child allows with core muscles and sitting straight and the disc are larger than the small wedge which fits perfectly on a child’s seat. Some kids chew on their shirt collar, their hair, their fingers and toes, the end of their sleeve etc. Other kids are drawn to items that are more firm and provide more resistance, such as pencils, the soles of shoes, the back of the couch, hard book spines etc . Chewing on non-food items isn’t “bad” in and of itself. The “heavy” sensory input provided to the mouth and jaw when chewing (known as proprioception) can help calm the nervous system when overstimulated, nervous, or overwhelmed (like how people bite their nails when they’re nervous,). 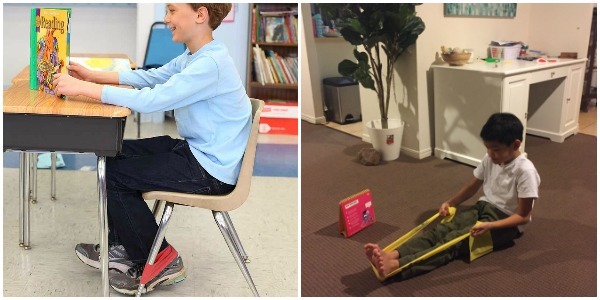 It can help “rev up” the nervous system when bored or in need of additional sensory input in order to focus on the task at hand, especially if the child is a sensory seeker or has been sitting or inactive for a while on the mat or in assembly. Chewing can also help kids focus when they need to concentrate or block out distractions or stressors in their environment. 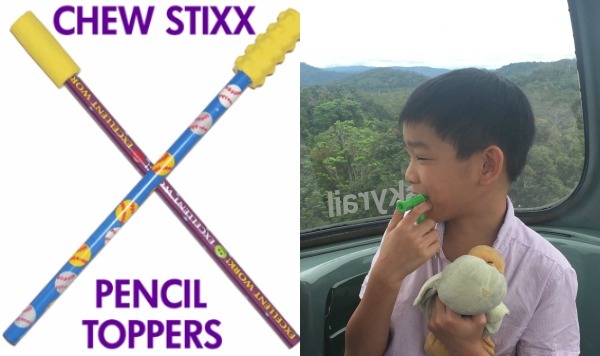 Both the Chew Stixx Pencil Toppers and the Chew Stixx-Pocket Stixx assist with this oral sensory seeking in a safe and easy way. My son uses these tools from his “toolbox” on his desk regularly. His teacher has set him up with an awesome system where if he is needing to grab one he can choose from the box to calm down depending on what he thinks will work. Fidget toys are self-regulation tools to help with focus, attention, calming, and active listening. Fidgets come in all different shapes, sizes, and textures. 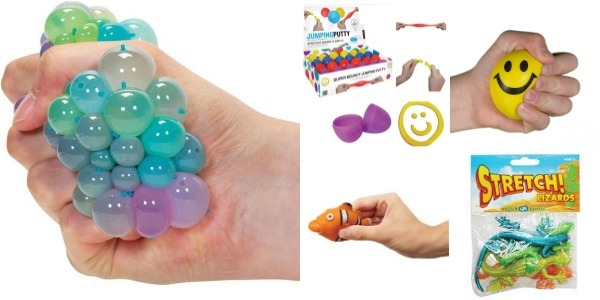 You’ll find things like stress balls, stretchy animals, small putty, therapy balls etc. Pretty much anything that can easily be fiddled with without causing distraction to the class or children around them. In 2003, a study was published in the American Journal of Occupational Therapy concluding that in students with ADHD, sitting on therapy balls improved behavior and legible word productivity. 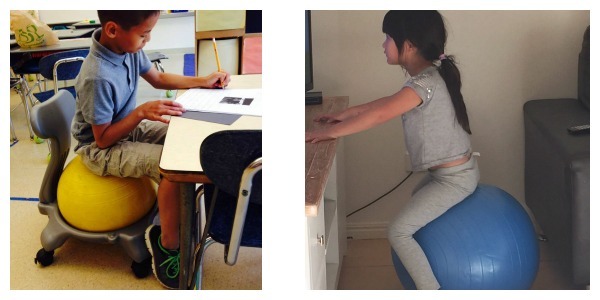 In other words, students using ball chairs were able to sit still, focus and write more words clearly. Since then there have been many studies proving the many benefits of a chairless classroom. Apparently there is a neurological pathway that goes from your body's balance and movement system to your alert system in your brain. Movement actually allows for alertness and attention . That's where ball chairs come in. Because of the ball's instability and in order to make it remain balanced while sitting on one, the body instinctively — and continually — engages core muscle groups. (remember using one of these at the gym – OUCH) Constant movement is required in order to stay seated on the ball. And that movement, however slight, helps kids focus. This one single item has been the saving grace for my son. We have a small lap blanket in each car, a large bed sized blanket to sleep with, a medium sized blanket to roll up in and or watch tv with after a particularly stressful day etc. My son LOVES this kind of weighted assistance. He also has a few weighted toys and a snake for school depending on his mood . I can’t explain but weighted blankets are one of the most effective tools for helping those difficult to calm down, high energy sensory kids. These blankets come in a variety of sizes, colors, styles and weights and can be used for toddlers through to adults. Weighted blankets are one of the most commonly used and "prescribed" interventions in the Occupational Therapy world. The therapeutic use of weight and "deep pressure" to the muscles, joints, tendons and ligaments allows the central nervous system to better interpret and integrate both tactile (sense of touch) and proprioceptive (sense of movement, body position, and pressure) input. The use of weight and deep pressure is at the core of almost all OT treatments that we have ever attended. It is safe, effective, and can make enormous differences in these kids! My child is a changed child when he has his weighted item on when he needs them! There are rules for the correct weight that should be applied and you are best to check all that with a professional or weighted blanket specialist. Pretty obvious reason here. Kids who are fidgety and distracted are simply that … distracted... They are so busy moving and grooving they forget the task at hand. This is a bigger problem when they are supposed to be completing a task at school. 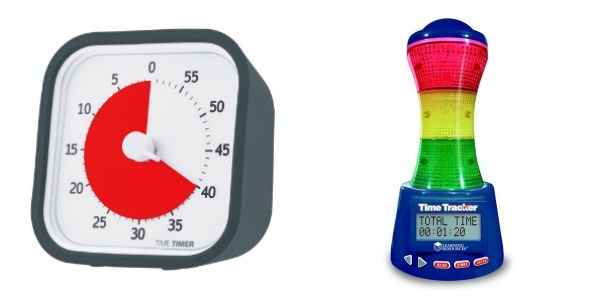 You can use the timers to show when a break will happen , to show how long they have to complete a task , how long they have left of play , how much longer of floor time ( boooorrring ) and for so many reasons. These are especially useful for kids who can’t tell the time or who need one on their desk to maintain that concentration to task. 8. Kids Teepee or quiet space. 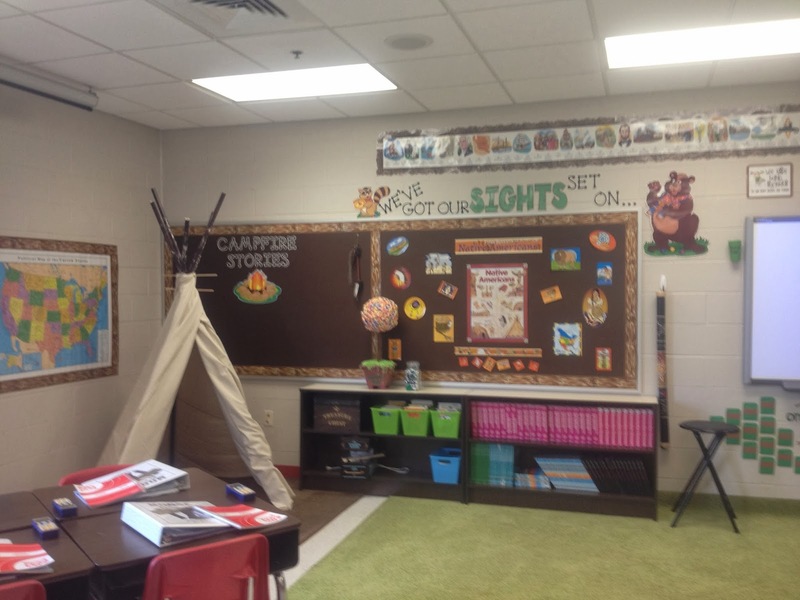 We use a kids tepee in class and at home to refocus during quiet time or to transition from one activity to another such as coming back in to class from playtime or sport where they have high “engine” from running around and or the playground shenanigans that have gone on and need to calm down a bit. Having a space to go straight to to settle and either have a book, fidget tools, weighted blanket etc is an invaluable way to calm the child down and then after a short time they can re-join the class refocused and ready. Transition times are hard for any kid but especially those who have attention, hyperactivity and or anxiety issues. Our school is awesome . When Sam (now aged 9 and in grade 3) needs a break from school work they send him on a helpful mission or task. The teacher will send him to the office or somewhere with a note in an envelope and he will deliver this note to that teacher (both teachers know WHY he is really delivering it) .But it’s a such a proactive approach to helping him get movement after or during a long activity and allows the classroom a break from the bouncing and distraction that can occur. PLUS he loves it, he gets to walk through the school in the sunshine , grab a drink at the bubbler and head back to class all refreshed and ready. BEST .. IDEA .. EVER .. This could be adapted depending on your child’s abilities, age and circumstances. Therapists and children both love theraputty for fun sensory stimulation games and hand strengthening exercises. This option is something that can be expanded on or just simply used at school to fiddle with. Premium quality silicone putty can be used for all your finger strengthening and exercise needs. I’m not talking about the fidgety stuff you get a t cheap shops etc . But this is non toxic, unscented putty and is extra clean and non-oily. Theraputty is a quality hand therapy product and is very durable. Its used by people to build hand strength and for kids can be used to draw out resistance (aka like a stress ball and to expel energy / stress) and also to strengthen finger muscles which help enormously with writing skills and lethargy when it comes to writing essays etc. We use theraputty as a “calm down” tool also when Sam is frustrated and unable to regulate himself down to a calmer state. The movement and soothing feel of the putty quickly eases most kids (and adults) . There are endless activities on google you can do to use theraputty and or you can consult an OT to help further.